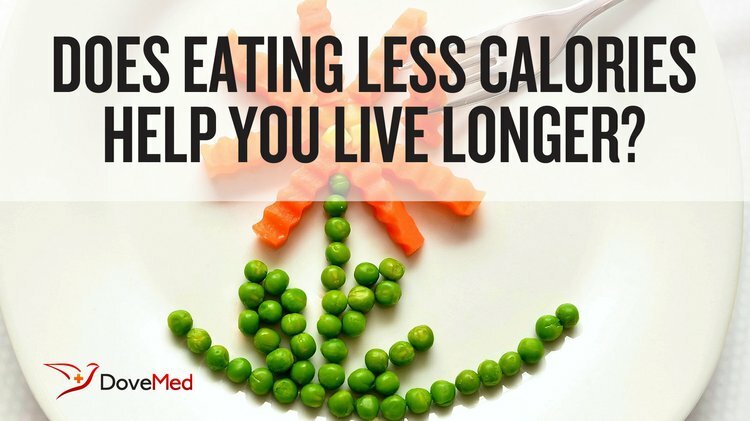 Does Eating Less Calories Help You Live Longer? Eating fewer calories or caloric restriction (CR) was first studied in 1935 in rats and was shown to prolong life span. The secret to a long life has been sought after by researchers for ages. Eating fewer calories or caloric restriction (CR) was first studied in 1935 in rats and was shown to prolong life span. Further studies went on to suggest that CR can prolong life in many different species such as yeast, flies, worms, rodents, and monkeys. In addition, CR has also been shown to improve age-related illnesses, such as cardiovascular disease, dementia, cancer, and diabetes, in rodents, non-human primates, and humans. Scientific data proving that caloric restriction works to prolong the human lifespan is limited. According to a calorie-restriction study conducted by John O. Holloszy of the Washington University School of Medicine, calorie-restriction subjects had better scores on major risk factors for heart disease, which included blood pressure, total cholesterol levels, and triglycerides levels. In comparison to the control group (who had 25% body fat), the CR subjects had very little body fat. The blood of the CR subjects also contained insignificant amounts of CRP, a protein that causes inflammation leading to diseases. According to the Calorie Restriction Society International, one should eat 25% fewer calories than the recommended amount in order to prolong their life span and become healthier. Individuals who practice CR also try to eat nutrient-dense foods in order to fulfill the body’s nutritional needs. Popular media reports voice the concern that caloric restriction could just be anorexia nervosa, an eating disorder. A randomized, controlled, clinical trial CALERIE (Comprehensive Assessment of the Long Term Effects of Reducing Intake of Energy) reported that following a CR diet did not increase the symptoms of eating disorders in the subjects. CR has been shown to prolong life to nearly 80 years. The mechanism by which CR works to lengthen life appears to be similar across species. CR appears to promote autophagy, the process by which cells recycle damaged parts into new ones. A lot of information is available about CR and supportive communities exist that can help one get started. CR is also called “calorie restriction with optimal nutrition” or CRON, which means consuming fewer calories while ensuring that the necessary nutrients are ingested as well. A mild form of CR consists of following a healthier diet, taking some supplements, and avoiding snacks. It is recommended that one start slowly and ease gradually into taking a CR diet. The first step is to eat healthier meals by cutting out the delicious, but nutritionally low processed foods. Once the CR diet is properly followed, one will notice the difference in overall well-being. Roth, L. W., & Polotsky, A. J. (2012). Can we live longer by eating less? A review of caloric restriction and longevity. Maturitas, 71(4), 315-319. Cohen, H. Y., Miller, C., Bitterman, K. J., Wall, N. R., Hekking, B., Kessler, B., ... & Sinclair, D. A. (2004). Calorie restriction promotes mammalian cell survival by inducing the SIRT1 deacetylase. Science, 305(5682), 390-392. Ornish, D. (2008). The spectrum: a scientifically proven program to feel better, live longer, lose weight, and gain health. Ballantine Books.